Data Mining for the Social Sciences: An Introduction is a short non-technical introduction to data mining for people who are interested in using data mining to analyze quantitative data, but who don’t yet know much about these methods. Data Mining, using automatic or semi-automatic analysis of large quantities of data to discover previously unknown or interesting patterns, is an approach that has emerged as an important force in computing and business over the last decade. Closely related to ‘machine learning’ and ‘business analytics,’ data mining is increasingly being used to turn raw information into useful knowledge. Data Mining for the Social Sciences explains what DM does and how it differs from more familiar or established kinds of statistical analysis and modeling and provides a sense of DM’s strengths and weaknesses. The book begins by discussing DM in general and demonstrating its distinctive perspective on data analysis and then introduces data mining’s main methods and tools. Data mining is spilling over into every arena where analysts encounter quantitative data: in the social and behavioral sciences, in policy analysis, and in education. 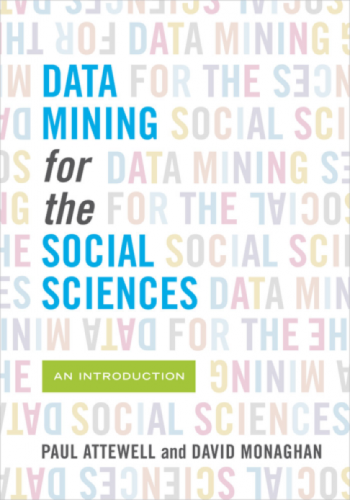 Data Mining for the Social Sciences is an introduction for readers who need to understand the way that all of these fields are changing.